Windows XP's market share grows AGAIN! It's the first Monday of the month, so time for us to have a look at desktop operating system market share again! 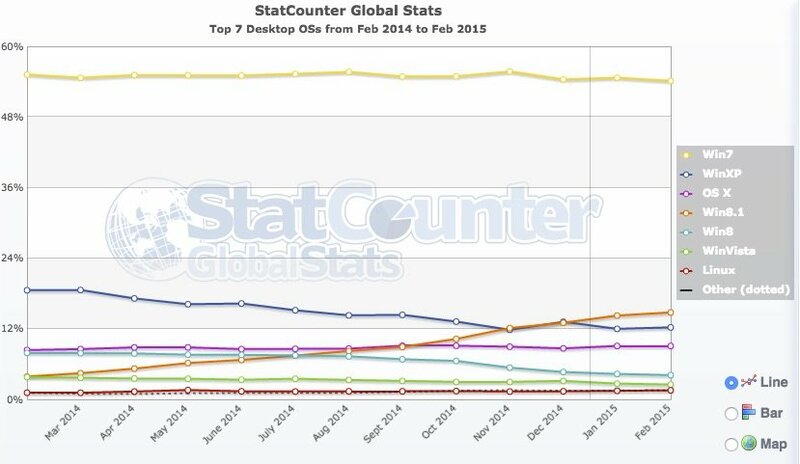 Keen Reg readers may recall that last month it looked like peak Windows 7 was behind us. This month's data supports that hypothesis: Statcounter has Windows 7 dipping a little to 54.13 per cent and Netmarketshare has it up 0.07 per cent to 55.99 per cent of detected desktops. Both outfits have Windows 7 below highs recorded in 2014. Windows 8.1 is up from 10.04 per cent in January to 10.49 per cent in February on Netmarketshare's numbers, and from 14.27 per cent to 14.78 per cent according to Statcounter. That near-half-point gain was, however, offset by new gains for dear old Windows XP. Statcounter had it up from 11.99 per cent to 12.23 percent. Netmarketshare has it edging up from 18.93 per cent to 19.15 per cent.